The warnings don’t seem to stop folks from breaking the law. 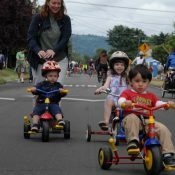 While everyone likes to argue about which type of roads users break more laws — and we are currently being forced to have the tired debate all over again thanks to a well-intentioned but misguided legislative concept — the Portland Bureau of Transportation is doing their part to address the issue. PBOT’s Crosswalk Enforcement Action program has been going strong since 2005. We checked in on one back in September and have reported on them many times over the years. The idea is simple: Place a human decoy (sometimes a notable politician but more often PBOT safety staffer Sharon White) in a crosswalk and wait for people to break the law while a phalanx of Portland Police motorcycle officers wait in the wings, armed with radar guns and quick twists of the throttle to chase people down. The efforts are usually quite fruitful and they offer us a small window into the rampant disregard many road users have for the law. According to PBOT records, in 11 separate crosswalk enforcement actions in 2014, the police pulled over 319 people (most of the actions last 1-2 hours). Of those traffic stops, 251 people were given citations and 68 others received warnings. The vast majority of the citations were written for violation of Oregon’s crosswalk law (ORS 811.028 a.k.a. “failure to stop and stay stopped for a pedestrian”). The other most common violations are use of a cell phone, speeding, not using a seatbelt, and so on. PBOT doesn’t keep track of what type of vehicle people were operating, but given the volume of biking and driving on these streets and what I’ve seen at these events first-hand, the vast majority of the citations go to drivers. 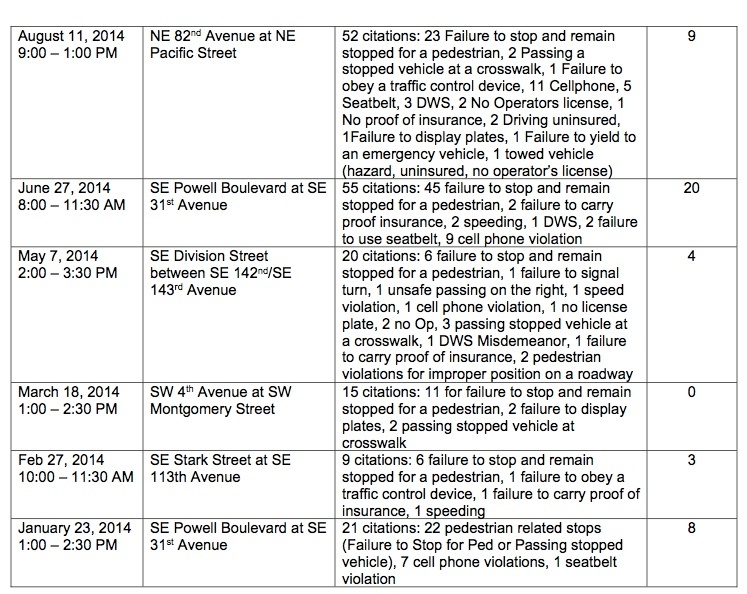 Detail from PBOT records on crosswalk enforcement action results. At their most recent enforcement action, which took place on December 16th at E Burnside and 24th, the Portland Police handed out 42 violations in just 1.5 hours. Here’s the breakdown (via PBOT): 22 Fail to Stop and Remain Stopped for Pedestrian, 2 Passing a vehicle stopped at a crosswalk, 5 Lighting violation, 3 Cellphone, 2 License violation, 2 Failure to obey traffic control device, 2 Expired tags, 1 Fail to drive in lane, 1 Proof of insurance, 1 Seatbelt, 1 U-turn. Think that one’s bad? 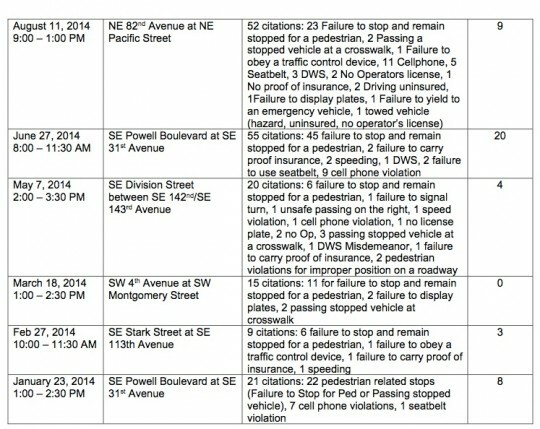 On June 27th, 2014, an action at SE Powell and 31st resulted in 55 citations. Here’s the breakdown of their haul that day: 45 failure to stop and remain stopped for a pedestrian, 2 failure to carry proof insurance, 2 speeding, 1 DWS, 2 failure to use seatbelt, 9 cell phone violation. And what makes this more amazing is that PBOT actually broadcasts the locations ahead of time both via media statements and on the road with signage alerting people that a special enforcement zone lies ahead. — See a recap of every enforcement action since 2005 via this PBOT document. Thanks for looking out for our safety, PBOT! Keep up the great work! I very much like that they do these, but I think that the number of citations they continue to yield even after 10 years of doing them is proof that enforcement is minimally effective at changing overall driver behavior. I think you mean that the sporadic nature of these and the level of the fines doesn’t amount to enough of a threat to where drivers are interested in changing their behavior. If the fine increased and/or the frequency of these efforts (maybe without the prior announcement part), I think you would see plenty of behavior change. It takes time and prioritization to drive this point home in the face of a century of selective inattention to this class of behaviors. These occasional enforcement actions are great theater, but I don’t think anyone would argue that they are the last word on enforcement. No, I mean relying on enforcement isn’t that effective. Short of placing a cop at every intersection, forever, you’re not going to get much effect from enforcement alone. I guess that’s the idea behind red light and speed cameras. Those have been shown to be effective at lowering the number of speeders and red light runners, but pretty much only at the locations where the cameras are, not so much in general. Making the punishment more severe is another story. I’m supportive of making getting and maintaining a drivers license much more difficult so even minor offenses would be grounds for a suspension or mandatory retesting and more serious offenses would be grounds for revocation. I think the more we grind home the idea that driving is a privilege not a right that people will tend to drive better and take rules more seriously. I’m not a fan of upping fines though, that tends to be ineffective and it is very burdensome on the poor while being basically inconsequential for the wealthy. It’s also the case the police tend to issue fewer tickets as the fines go up which leads to uneven and often arbitrary enforcement. What I support most is engineering measures that serve to make it much more difficult to drive dangerously. That is things like road diets, lane narrowing, etc. that force drivers to slow down among other things. We have a lot of tools available we just need to use them and make sure that we are prioritizing all road users in road designs and not just speed of motor vehicle traffic. I think you’re taking a very limited view of enforcement. Now you’re talking. This is a dynamic matter; it takes time and persistence to reintroduce these priorities. There are lots of more interesting ways to go about this. In many European countries certain categories of traffic infractions are punished with fines calculated based on income, so a really rich dude speeding at 250k/h might get slapped with a million Euro fine and have his expensive sports car impounded. I disagree. The traffic enforcement section of PPB is negligently understaffed, particularly from a Vision Zero/Safe Systems perspective. There’s a town in Washington called ********. You don’t speed through it too often because you get pulled over if you do. If the PPB traffic division was tripled or quadrupled, people in Portland and coming to it would slow down and be much more cautious. Exactly. This is about priorities. That’s my point though. Those small towns commit 2-3 officers to a fairly small stretch of highway basically full time unless they get an emergency call. They can only maintain that because they can issue a near constant stream of tickets too, so compliance may be a little better but it’s still not great. I can pretty much guarantee that elsewhere in those towns people continue to run stop signs and ignore crosswalks too. Portland has nowhere near the resources to commit that much to traffic enforcement, and we likely wouldn’t like it that much if they did. I’m not saying we don’t need enforcement, I’m saying that the things beyond enforcement are much more important. Again, I disagree. The model everyone talks about is Vision Zero, and it’s borrowed from the Safe Systems approach, which is based on Sweden and Austrailia’s versions. The best system approaches the problem from multiple directions. Not just lower speed limits. Not just completed streets for all users. Not just better and more frequent enforcement. Not just tougher laws or stiffer penalties. Not just safer cars. Not just better driver training and testing. Not just longer sentences for the guilty. All of the above. I think we mostly agree on that, I’m just more jaded about the role of enforcement. I agree we’re on the same page. That small town I mentioned can’t have more than 5 officers for a population of less than 3,000. Ratio 1:600. Portland has, maybe 20 or 30 traffic officers. At best the ratio is 1:20,000. This may be true if the number of citations was significant. As it is, the odds of getting cited for a crosswalk violation are so astronomically small that enforcement is essentially nonexistent. There needs to be some enforcement to test the hypothesis that enforcement doesn’t change behavior. Go some place where they actually enforce crosswalk violations (Hood River) and see how many cars stop. Enforcement does work if it is not a once a year publicity stunt. Punishment (enforcement) is most effective when it is assured. Hit-‘n’-miss enforcement triggers the same psychological response as gambling—except that in the traffic violation gamble, you win! All the time! The reward for violating traffic law (a sense of “beating” the system or “winning” the race against your fellow drivers) vastly outweighs the perceived risk of getting caught and cited. Automated enforcement (nearly impossible to do with crosswalk or other failure-to-yield violations) would be a much better deterrent to bad driving. A $25 fine every single time a violation occurs would be more effective at modifying behavior than a $300 fine that you think you’ll never get—or at least don’t think you’ll get until after well over 12 such violations. They would likely have more of an impact if not announced ahead of time, and done at multiple places every day rather than once a month or so. The safety issue might be more effectively resolved if pedestrians were also cited for not yielding to vehicles as required. Check out the Ray Thomas ad at top right. Go the Pedestrian Rights link and read the info on pages 21-23. I would venture to say that about half of pedestrians fail to meet the distance requirements listed. And yes, I got my last moving violation 45 years ago. I object to the characterization of “going strong.” The number of enforcement actions is fewer than one per month! And, they last only a couple hours. I’d call it “lip service” that allows them to claim that they are doing something to “protect” vulnerable road users. Given the rampant disregard for the law every time they conduct an enforcement action, there should be at least one enforcement per week! I see motorists failing to yield to pedestrians (often myself) EVERY day. I sometimes stand in the street clearly visible to oncoming motorists as ten pass me before one finally yields. Besides having a crosswalk enforcement every week, I have another suggestion: Require the motorists who fail to yield to serve as a “decoy pedestrian” (under the guidance of Sharon White or whoever is in charge) for a subsequent crosswalk enforcement action. Let the scofflaw motorist who fails to yield have the actual experience of being a pedestrian. Finally, I hope that a motorist who passes a motorist who has stopped for a pedestrian gets multiple citations, maybe including reckless driving. That passing maneuver is a really dangerous action for pedestrians. Keep in mind that this is just a program withing PBOT that focuses specifically on crosswalk law. The PPB does enforcement actions all over the city on all types of specific violations every single day (they are just not publicized or put into a special program). I know this because I’ve joined them on one or two over the years. Each new shift (at least at Traffic Division) they meet for “roll call” and the commander will assign officers to a specific street/intersection to watch for a specific illegal behavior — often at the request of citizens, PBOT, other officers, and so on. I had fun one day sitting in a patrol car on an onramp to Hwy 26 near the zoo staking out freeway speeders. Me and an officer zoomed around for about an hour pulling people over! But J_R has a point. If this were pretty much any other category of rule/law breaking would we see this kind of nibbling-away-at-the-margins approach, these token fines? Drug possession? Shop lifting? Living while black? Sharon White and Sgt. Robert Voepel (who spearheads the crosswalk enforcement actions) visited the City’s Pedestrian Advisory Committee (PAC) meeting last week and we asked them the same question – if there’s so much ignorance/non-compliance around xwalk laws, why not do these every day? One of the main reasons was cost – the PPB doesn’t have room in its budget to cover officer time for these actions and currently covers much of their costs with state grant funding that they have to apply for each year. And despite the dozens and dozens of citations issued at each enforcement action, they’re not money-makers. If an offender takes the 3-hour Share the Road safety class (great BP guest article on it here, s/he may avoid the large fine and mark on their record. The reason for that being that PPB and PBOT prioritize education over punishment for these types of offenses. They’d rather have someone put their own time into becoming a better driver than smacking them on the wrist. Getting a large fine tends to leave a driver just marginally better informed (“Don’t do this one thing”), but the class educates the driver on the full rainbow that is multimodal safety. So this driver would not only learn the laws about marked crosswalks, but also unmarked crosswalks, and also why it’s not cool to long-honk at you when you take the lane biking down NW Everett. That said, PAC member/awesome person Scott Kocher is leading an effort to follow up with Sharon and Robert about some outstanding concerns. If BP readers have some specific ?’s regarding xwalk enforcement actions that they’d like us to add to the list, shout out. If education through the participation in a class causes better motorist behavior, I’m all for it. Let’s see, we have 11 enforcement actions per year and 40 motorists from each opt for the class, that’s 440 drivers per year who get educated. By itself, Portland has about 400,000 licensed drivers, so half the Portland drivers will have been through the class by 2615 assuming they live that long. Not going to work is it? 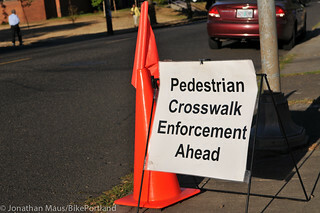 I absolutely love that PBOT organizes these crosswalk enforcements. That’s my hood, I’ll back that one up….. The big stick approach doesn’t work unless they can ticket a lot of people over an extended period of time, which would be very expensive. Maybe we need a bigger stick! See my suggestions above: require scofflaw motorists to participate in an enforcement action. Cite them for reckless driving. Larger fines. Something…. Enforcement has to be present 100% of the time to have any effectiveness. Just look at the outrage surrounding red light and speed cameras. People lose their minds when the government tries to get them installed. HAHA! Yea, the red light camera’s at SW Bridgeport RD & SW 72ND AVE in Tualatin flash constantly. People headed through that intersection aren’t strangers, they are commuting to work in either Portland or Salem via I-5. Constant enforcement hasn’t done anything IMO. I’ve biked/bused/walked through this location for 1.5 yrs. Fines need to rise, making someone physically show up to more than one class/community service might go a lot further, taking someone’s time which isn’t as renewable as money may make the biggest difference. One block South of that intersection is where I tend to cross to get to the Park & Ride. It’s unmarked, people never stop, they might slow and creep and they almost always honk or yell at me that I am crazy or suicidal. I’ve even had one fellow pull over and ask me why I crossed. For my part I never run or rush across the road and I’ve taken to just stepping out and walking slowly across. Parting the sea of cars like Moses. I have very little rights as a pedestrian, I will not give away any more inches, walking or riding my bike, heck, I might even take a little extra time getting to where I am going. Chris, from an economics standpoint, random enforcement is better. More frequency is the issue in Portland. A while back I did some research on the types of crosswalks where these enforcements were done and, if memory serves, approximately 90% were done at marked crosswalks. I for one am at a loss as to why the vast majority of these enforcements are done at marked crosswalks while the vast majority of crosswalks are unmarked. The knowledge level as to the right of way for people crossing at unmarked crosswalks is a sick joke. I have had drivers accelerate at me at unmarked crosswalks and proceed to scream that where I was crossing was not a crosswalk. Focusing so much on marked crosswalks really only serves to reinforce the notion that the only “real” crosswalk is a marked one. Please, please, please, PBOT, the ratio of enforcements at marked crosswalks should roughly match the ratio of marked crosswalks in the city. This is an issue of nearly unanimous ignorance and I really don’t see you doing anything to combat it. while you have a great point, i’m guessing that your personal experiences you outline above are the same reason they don’t do enforcement on unmarked crossings… nobody wants a broken hip as part of a police sting. If you are standing in the road, you are in the crosswalk. You don’t actually need to be in front of the car. I agree with Tony T, there should be some enforcement actions at unmarked crosswalks! False. Crosswalks are a legal definition. Unmarked crosswalks only exist where two roads intersect and are defined by the edge of roadway, or curb, and back of sidewalk, or property line. Yes to this. I really wish they did more unmarked crosswalks. On the 800 or so walks I’ve taken my dog on, I have had a total of 5 vehicles stop for me trying to cross 92nd Ave in SE. That is 5 out of 1600 crossings. That’s 0.3%! It is just pathetic. During low light times I even have a reflective arm band on each wrist, a bike light in my hand and a blinking light on my dog. There is no way they don’t see me, and I even make sure to put my foot slightly in the road each time. More unmarked crosswalk enforcement actions! i see this type of behavior all the time on lower se division. pbot’s “safety project” has been a disaster, imo. I’m glad I’m not the only one… last year while crossing SE 12th on Ankeny (unmarked crosswalk) the light up at Burnside turned green while I was entering the right lane of 12th while proceeding across, and the driver of the van to my right actually tried to angrily run me over, hitting the accelerator while yelling as I jumped out of the way. I’ve requested enforcement action at this intersection and none has happened. I also made a request for this crosswalk to be marked, especially considering the fact that it’s a neighbourhood greenway, but PBOT refuses on the basis that they believe marked crosswalks are more dangerous because pedestrians can have a false sense of security. But what about drivers who have a false sense of following laws? and more common than you might think. Ankeny and Sandy could use some attention, too! I’m happy to see these taking place. As a pedestrian I’m often appalled at how many people fail to stop. It’s particularly bad at unmarked intersections – which are crosswalks legally – but it astonishingly happens frequently at marked crossings as well. One thing I’ve found that helps is looking directly at the drivers and throwing a hand towards them, motioning to “stop.” Sometimes they get crankier but it has a much higher success rate. It seems that some actual communication towards drivers can momentarily remind them that there’s a world outside their big metal box. Scofflaw motorists! No more funding for auto infrastructure until all drivers obey the rules! Haha, but seriously, passing a stopped car at a crosswalk is an action that really pisses me off. Do speed monitoring (no tickets) at several major routes in town and stop all pothole repairs and repaving jobs (other than bike lanes) until speed compliance hits 95% (5% of drivers exceeding the speed limit by 10 MPH). And 100% speed compliance in school zones, one driver at 21 MPH and no car infrastructure for a year. Mention this frequently in the news (“a blue sedan broke a school zone this morning, that means no pothole repairs for the next 12 months“) Tell drivers that other drivers breaking the law is costing them money in car repairs from bad pavement and drivers will start to drive within the law. And until then divert the savings to neglected bike infrastructure so that some of the backlog of unfunded projects can be cleared away. Same thing at the library on Woodstock. Compliance has been improving over the years so now almost half of motorists stop for pedestrians. I’ve still had motorists yell at me even in that marked crossing. Probably not neighborhood folks giving you trouble. That’s a Clackastani commuter corridor. When I need to drive the car through there, I’m always at 25 MPH, tops, and stop for every pedestrian and opposing car trying to turn left. Drives those behind me nuts. You stop for opposing cars turning left? That’s illegal. I guess I’m a soft-hearted scofflaw motorist. Common, an unending line of cars behind you, one lane each way, maybe a middle turn lane, drivers typically bumper to bumper, blocking the intersection when the light goes red. I’ll slow to give space and give the waiting car a little wave across. Ticket me. I’ll pay that fine and bank that karma. Woodstock has a middle turn lane though, so a left turning car isn’t going to be hold up traffic going the other way. I just wish more Portlanders would follow the right of way laws. It actually makes it more dangerous out there when you don’t. (and what about the bike that might passing you that the left turning car doesn’t/can’t see?). You’re right, of course. Everything works better when we all obey the right-of-way. Actually, there are relatively few blocks of Woodstock with a center turn lane. What rainbike is doing (stopping for an on-coming vehicle to make a left turn) is actually legal (and required) if he would otherwise be blocking an intersection. Woodstock does suffer from bumper-to-bumper traffic eastbound during the PM peak hour. I think it’s illegal to waive cars through, though. I live about a mile from there and 42nd-52nd has a middle turn (which is pretty much almost all of the major business district in the area) where most of this back up occurs. And sure if you’re completely stopped you aren’t supposed to block a cross street, but I don’t think that’s entirely what she’s talking about here. I’ve never been yelled at in a crosswalk (except when I lived in Czech Republic 10 years ago), but I’ve never had 1 car stop for me crossing Division at an unmarked crosswalk just east of 60th. Even in the marked crosswalk (66th?) I experience an abysmal compliancy rate. Well obviously, because if you have a car, you’re successful, and if you walk it’s because you’re poor, and if you’re poor it’s because of a defect in your character. I would think the only way to suggest these programs are really working and worth the money is to gauge if they are truly changing drivers’ behavior. And to do that, the PPB would need to run the same sting at the same amount of time at least twice in a row. If the number of citations are less, then something’s working. If the number of citations are higher, I don’t think we can say these stings are having any real impact. Using that method to gauge success is a little too simplistic. What if this program saves one person from being killed in a crosswalk. Was it worth it then? What if that person were a relative? I cringe at those kinds of hypothetical (simplistic) statements. Mostly because by taking this tack you’re eliding the possibility that a broader, more serious effort could make a far greater dent in this problem. Like an across-the-board 20mph speed limit within towns and cities, or actual (because they are unannounced) stings all across town, 300 days a year. Or empowering citizens to use their cell phone cameras to initiate proceedings against people driving in this manner…. I see no problem with an across the board 20mph in town. And mind you I’m required to to drive for my job all over town. I’m more than happy to leave a few minutes earlier for safer streets. Besides at peak hours who’s really driving much faster than that in the city core or middle area? I think 250 days a year should be enough, that’s Mon-Fri every week. Don’t want to run up the overtime costs. And raise the fine to something high enough to cover the costs of enforcement. What if these enforcement actions aren’t meant to increase compliance but are just a bit of strategic theater? A way to show your publics that you are doing something about this problem? I don’t mean to impugn Sharon White and her colleagues in the slightest. I don’t doubt that they are sincere in their efforts, but at one step removed from their personal commitments I think it is fair to ask whether this kind of gesture is really adequate to the situation? What would a city committed to Vision Zero do about this pattern? How would we proceed if we were committed to putting an end to this kind of attitude—that if I’m in a car I don’t really need to stop here? Seriously…………..I like the idea of punishing the whole class for the deeds of the worst kids. Auto theft and vandalism should cease to be crimes worthy of police time until there is one full year without any pedestrian killings. Of concern to cyclists in that same statute is that a bike lane is deemed to be the same as the adjacent car lane. With the requirement to stop arising unless the pedestrian further away than all of the adjacent lane (me paraphrasing), it looks like a cyclist in a bike lane on a two lane street must stop once the pedestrian moves to enter the crosswalk on the other side of the street. I do all the time. That is of course no guarantee that the first or second or third car will slow to a stop, but it starts the process. It’s all about assertiveness + not trusting the person behind the windshield. I also do this all the time. Methinks old Mandy can’t really see who is doing the greater harm. I have to agree with a lot of the sentiments here. On my average daily work commute (15 minutes on foot each way, from the western edge of downtown to Northwest), I could tally more “citations” than any one of these enforcement actions. Failure to stop for pedestrians, failure to stop at stop signs, illegal turns and u-turns, cell phones, seat belts, missing plates, you name it. Crossing Burnside at 21st Place, even with the marked crosswalk and adjacent construction, I might wait for as many as 15 cars to blow by before a responsible/decent driver stops as required by law. Sometimes, I wonder if it wouldn’t be worth it to just carry one of those small stop signs on a stick when I walk. I imagine having an easier time stopping cars if I walked off the curb holding one of those up. I love it when you step into the roadway to cross and the driver just goes around you like you’re a pothole. Great they’re cracking down on crosswalk enforcement with pedestrians but what about bicycles lawfully using crosswalks (even walking the bike) only to be ignored as we’re not considered “pedestrians”? I have a horrible time trying to cross Cesar E Chavez at Ankeny on my daily commute even though the signs show bikes and peds. I had a PDX cop stop in the opposite lane and when no other cars would yield, turned on his emergency lights shaking his head that everyone was so oblivious. While I find this story and subsequent comments about cars and pedestrians very interesting and informative, I don’t really see the direct relevance to cyclists – other than as pointed out by onegearsnear above (i.e. those rare situations when a cyclist dismounts and walks the bike through a crosswalk). Cyclists have the same duty to stop for pedestrians. But I’m not getting that vibe from reading the article and discussion. It seems to me that this is about slamming drivers… that seems to be the tone here. 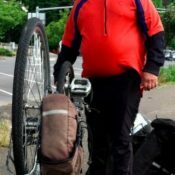 Of all the comments so far, only one (by PdxMark) addressed the issue from the perspective of a cyclist’s legal responsibility to yield to pedestrians. I just find that a bit weird for a cycling-centric blog such as this. I think some of that is pent up frustration about the oft heard “those cyclists need to obey the law like drivers.” When we see enforcements like this, with the high rate of citations, it merely proves what so many of us have known all along; that people driving are hardly paragons of virtue regarding following the law. It’s just that they break the laws in different ways. People on bikes tend to roll stop signs, people driving tend to speed and not yield to people crossing. 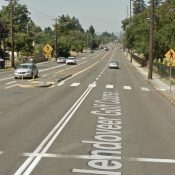 This blog also covers pedestrian issues (esp. moreso since Michael joined). It’s not 100% bikes anymore. Not in the Lloyd district, apparently. 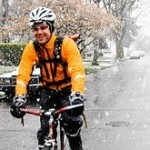 I have never, not one time, seen a cyclist stop for me when I’m in the crosswalk on Multnomah. 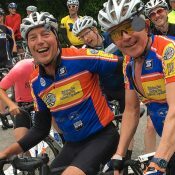 People on bikes don’t kill thirty thousand plus of their fellow citizens each year. If motor vehicles only 30K in a year the US DoT would be doing collective backflips. When crosswalk compliance is taken seriously we’ll solve distracted driving at the same time. Why? Drivers who pass those big CROSSWALK ENFORCEMENT AHEAD signs and still don’t stop for Sharon in the crosswalk aren’t paying attention. This isn’t about courtesy. It’s the inattention to other people using the right of way that endangers everyone, including people on bikes. Indeed. If people were always looking for peds at the next intersection, speed would go down and more attention would be paid to the general environment. From how I see it, (and this goes for just about everything) the old saying of a chain is only as strong as it’s weakest link applies. And as far as transportation goes, pedestrians are the weak link. And if the weak link is strengthened then the whole chain benefits. Besides I bike because I’m lazy and cheap…..And if not for the bicycle I’d be walking a lot more. Got questions for the City about crosswalk enforcement? Got ideas for improving compliance? Send them my way and I’ll put them in the mix for the Pedestrian Advisory Committee. scott[at]forumlawgroup.com or 5oh3-445-2102. Thanks for the shout-out Rebecca ;). crowdfunding? Like private permits for street events, but with police. I’ve been advocating every year that from October to March, when there are evening commutes in darkness, that’s the timing when that months’ the enforcement actions should occur. The one on Powell at 45th a couple of years ago (a marked crosswalk), yielded a much higher ticket count than most of the other actions (especially the ones from 1:00 to 2:30 in the afternoon). That was at 54th, not 45th. Even has a median to make it safer. I experience my own version of that Pemco “4 way stop” commercial most every time I ride the East side section of SpringWater. Get to an intersection where I have the STOP sign , I stop. Crossing traffic does NOT have the STOP sign , yet they stop , wave me through and wait till I’ve crossed. I live in Sullivan’s Gulch, and I’m surrounded by unmarked crosswalks where rarely anyone stops. Try crossing 3 one-way lanes of Broadway in any of the unmarked crosswalks, it’s ridiculous. Or Weidler. Those are both treated like highways slamming through my neighborhood, drivers driving so fast they barely notice me as they are speeding past my upraised arm, signaling my desire to cross. This area has a high concentration of mobile elderly residents. Imagine the horror of watching an elderly man scurrying across Broadway with cars barreling down the “highway” – it’s horrifying. My son almost got hit crossing 21st at Clackamas crossing from the trimet bus stop, in a dense residential area, b/c a car stopped going one direction but the driver in the other direction wasn’t paying attention and didn’t even slow down. What the chart says to me is that even when people are notified in advance that they are watching for a specific type of violation at a specific place during a specific time, there’s still scores of people breaking the law. Imagine how many people do it when there’s no one watching. « Safety advocate to Novick: Where’s the Barbur study you requested?